Guys! It’s 2017 — Happy New Year! I may be officially the least helpful food blogger ever this holiday season, for which I apologize: by my count, I managed to miss the solstice, Hanukkah, and Christmas entirely, and I started it all off by barely squeaking in before Thanksgiving with a recipe both untraditional and slightly fiddly. Go team Optional Kitchen? I stuck bacon in a different dish, so apparently I don’t feel like it all has to be together. I’m counting okra as a green here (because it’s… green? ), so apparently I’m pretty lax about ‘greens’. I actually made this dish on January 2nd because I knew I’d want to photograph it and I had to pick up Jarod from the airport during the little window of good midday light on New Year’s Day, so apparently I’m pretty loosey-goosey on the date as well. After some Googling, I found a recipe for a curry that combined the Malabar Spinach with black-eyed peas and a combination of seasonings that was simple and fragrant. I made that curry a good dozen times that summer, because I was obsessed. 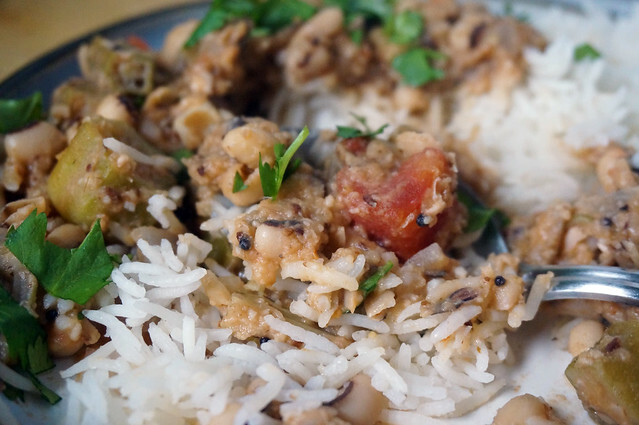 The Malabar spinach and tomatoes and coconut made a thick, sweet, fresh sauce that offset the earthiness of the black-eyed peas perfectly and I simply couldn’t get enough of it. But then after that summer I’ve never seen Malabar spinach at the farmers market again, and I never seem to quite remember to look for it in the Indian grocery. Fortunately, at some point I had the bright idea of using okra in its place, since okra has the same thickening powers as Malabar spinach. I worried that it wouldn’t have the same magic to it, but my fears were unfounded: it’s great. So now, since I pretty much always have frozen okra in my freezer, I can have delicious curry whenever I feel like it, which is a very good start to this year. Happiest of new years to you; may you eat in good cheer. Adapted from Mangalorean Malabar Spinach Curry at Veg Recipes of India. Soak black-eyed peas overnight in salted water. Drain, then return to saucepan with 2 1/2 cups of lightly salted water; bring to a boil, then simmer, covered, until tender, about 20 minutes. Set aside (do not drain). Place a small skillet over medium-high heat, and add the coriander, cumin, peppercorns, fenugreek, and chiles (dry; no oil in the skillet). Toast, stirring frequently, until they are fragrant and very lightly browned. 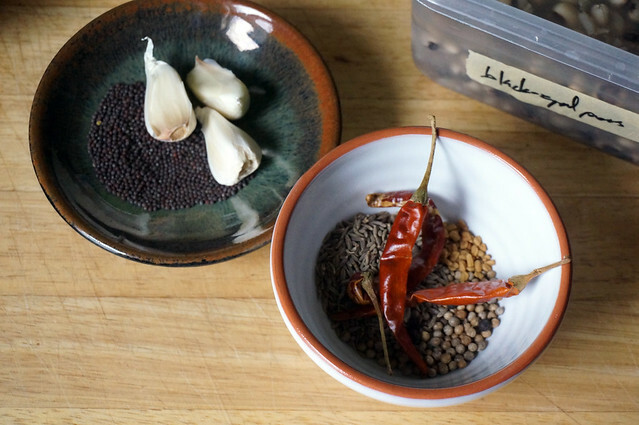 Process in a spice grinder or blender until well-ground: it doesn’t have to be a uniform powder, but there should be no large pieces of spice or chile remaining. Add the pinch of hing, if using. In a wide skillet over medium-high heat, melt the coconut oil. Add the mustard seeds and cook, covered. The seeds will pop; continue cooking, shaking pan occasionally, until most of the seeds have popped, then uncover and add the onion and garlic. Sauté until onion turns translucent, about 5 minutes. Add the spice blend and sauté about 30 seconds, until the spices smell very fragrant. Add tomato, okra, black-eyed peas, coconut, and a heavy pinch of salt. Bring to a boil, then simmer for 30 minutes, until the okra is completely tender and the sauce has thickened. 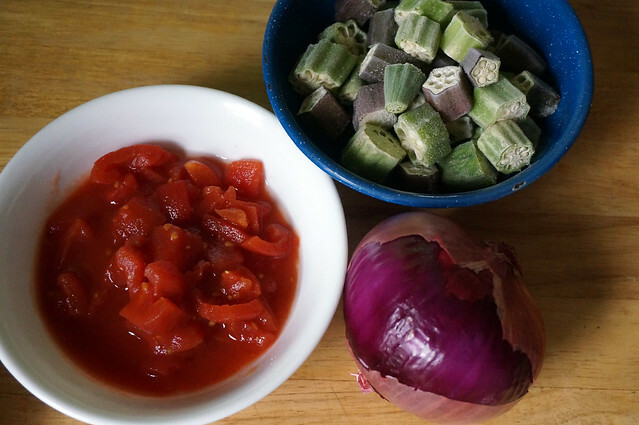 This curry should be medium-bodied, so depending on the thickening power of your okra, you might need to add up to a cup of water; just keep an eye on it as it cooks, adding water if it’s getting too thick. Once the okra is tender, remove from heat and stir in the cilantro. Serve with rice and any other accompaniments you like. The recipe I’m adapting calls for Malabar spinach, a vine which is rare in American supermarkets. However, it’s worth sourcing for this recipe — see the Wikipedia article for other names by which it might be called in ethnic markets — since it’s really lovely in this recipe; you’ll want about 1 1/2 cups of chopped leaves and stems. Don’t feel like cooking your own black-eyed peas? Use two cans (the standard, 14 or 15 oz. size). You can dump them directly in the pot without draining. This recipe also works with coconut milk instead of the rehydrated coconut. The texture’s a bit different: it’s smoother and a bit more liquidy, and its flavor tends toward sweetness rather than earthiness. These aren’t bad things, mind you: just different. 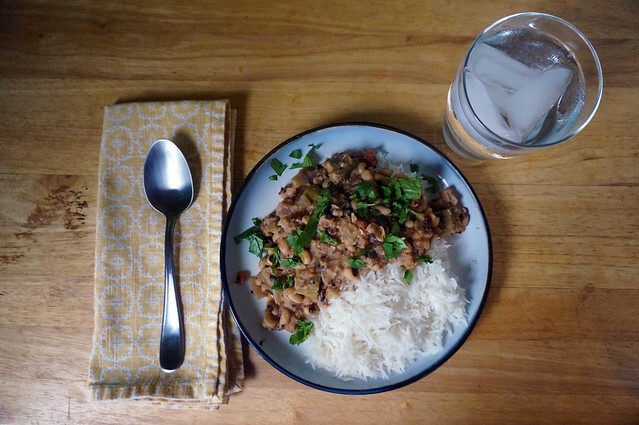 Use about a cup of coconut milk, and reduce the cooking liquid in the black-eyed peas to 2 cups. You will almost certainly not need to add any water during cooking, but keep an eye on it just in case.